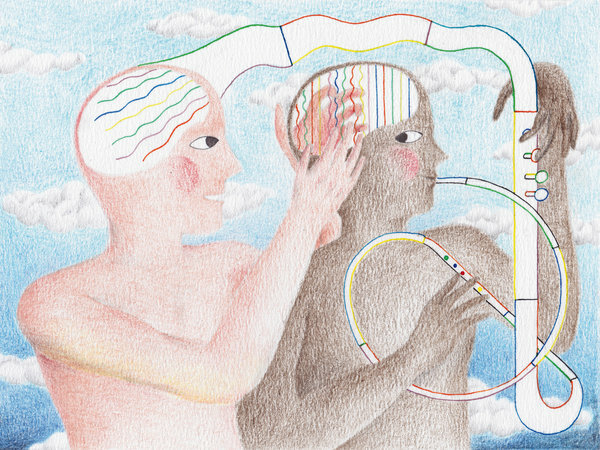 The New York Times just ran a nice article about music and the brain. In it neuroscientists Robert Zatorre and Valorie Salimpoor touch on some interesting ideas about music and the auditory cortex. I wanted to share it with you and hear your thoughts. So, if you get a few minutes to read it let me know what music makes your brain sing? We are selected as rythm listeners, while still in the womb by our mothers heartbeat, etc. Also dopamine is released in our brains during any pleasurable stimulus thus reinforcing sounds that can sustain and engage our neurolinguistically evoled selves. If dopamine is released in our brains during any pleasurable stimulus – and music is one such stimulus – then what is happening when music is used for other non-pleasurable events, such as torturing (this is the dark side of music…)? Horrible music illicits human panic response initiated by the release of the fight or flight hormonre adrenalin. Exactly Dan… People may not release that the wrong music for them, is not only an aesthetic insult, but also a physical assault and threat to their health. The biological organism requires not only an external source of gravity, but a pressure of a domestic medium as a function of gravity. And, so long as there is a normative spatial separation between the organism and all other important solid objects, it seems undeniable that vibration of the organism’s domestic medium is a primary stimulus to the organism, both in terms of itself and in terms of the primary dynamic objects in its environment. Can you say ‘music’ and ‘society’? Gravity acts as counter-balance to the self-repetition/identification, and self-expansion activities which constitute every known biological organism. This implies, first, that the biological organism is not a self-contained set of all forces necessary to its own survival and development. Second, it implies that the biological organism is, in some way, a product of its gravity environment. In fact, given its own mass, a biological organism is constituted partly by gravity. I suspect that all known biological organisms require a minimum of compression of a domestic medium to survive (atmospheric pressure). Hypothetically, this pressure could be said to act as a necessary counterbalancing force to that of the self-repetition/identification, and self-expansion, activities of the autonomous biological system. In other words, it seems that atmospheric pressure, in conjunction with a basic minimum external gravity, is necessary to the long-term survival of a species. Pressure of domestic medium is, for the most part, a static force. But, in order for an organism to identify other organisms without direct contact, and, thus, to develop internal systems to identify itself apart from other organisms, an organism’s domestic medium must include vibrations produced by other organisms. Based on this theory that vibration of domestic medium is critical to the normal development of an organism, I propose the hypothesis that music and language are basic cognitive functions prior to their respective conventional specializations. Think sense and reference. According to this hypothesis, only later are the sense and reference functions in humans channeled into conventions: the language function normally is channeled into speech, and the music function normally is channeled into human artful sounds. But, there is a problem. According to this hypothesis, the conventions intuitively are known to contain their respective basic functions, so, oftentimes, the conventions are mistakenly equated with their functions. Hence, the popular human notion that the essential roots of music and language are not naturally possessed by non-human animals. But, if vibration of a domestic medium is necessary to the survival of any given animal species, including to humans, and if that vibration is a key stimulus to biology, and, thus, to psychology, then non-human animals do possesses a level, however primitive, of both the referential and sense/aesthetic modes of cognition. How well or how often the non-human animals practice a distinction between these two modes is beside the point.